I can still remember the first time I saw the movie when I was 11 years old. It was on an old black and white antenna tv, the sound turned almost off so my parents wouldnt hear it as I wasnt supposed to be up that late, but it didnt matter... I was there, I was at Clavius Moonbase, I pulled HAL's memory modules, I was the monkey that cracked the skull of the rival leader. This is the movie that got me hooked on SCIFI . Stanley Kubricks's EPIC interpretation of the vastness of space, The sense of reality with which the film is shot, the 2 minute blackscreen intro, the special effects, the far reaching concepts, and good god ... the books by Sir Arthur C Clark were even better! Anyway, after the build of the USS EURISKO - Intrepid Mark II Class (It only needs a good paintjob) I got in contact with the Dutch Modder Nixjuh. We started talking about our passion for SCIFI on the SCIFI OCD group and he showed me some of his work. His artistic skills are off the charts and we soon started brainstorming on how we could use his drawing and sculpting skills on a tribute pc to one of our favorite movies. 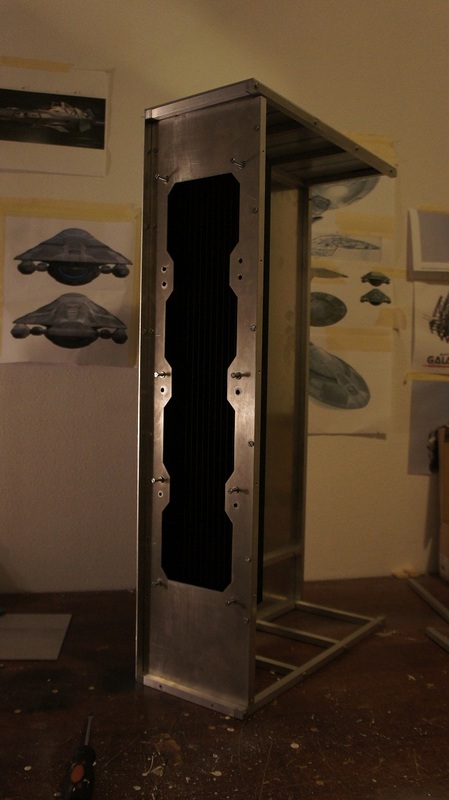 The shape of the Case resembles the Monolith TWA-1 from the movie. 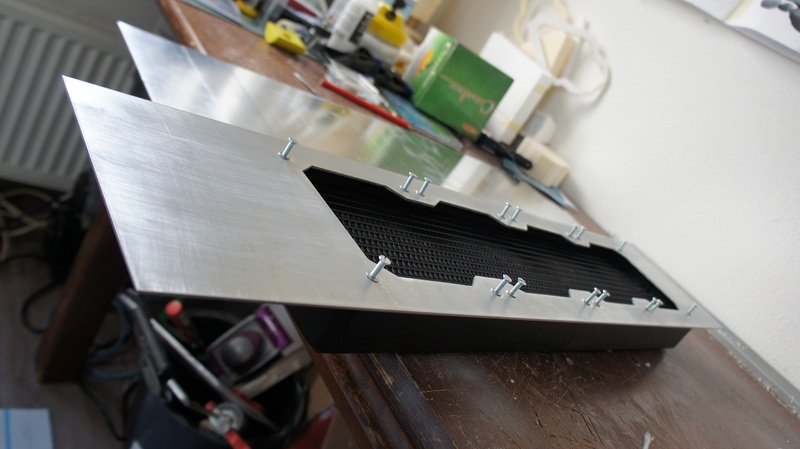 We could not keep the 1Ã‚Â².2Ã‚Â².3Ã‚Â² dimensions without making the case huge or to thin for any hardware, so we ended up with a design that was 80cm high, 43 cm wide and 18 cm deep. In real life the monolith shape does come out a bit better then in this 3d render. 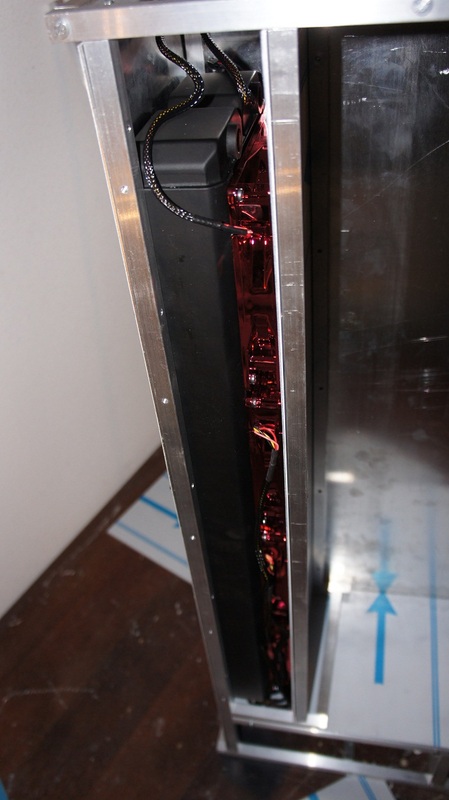 The inside of the case has been designed to resemble the inside of the HAL9000 computer. 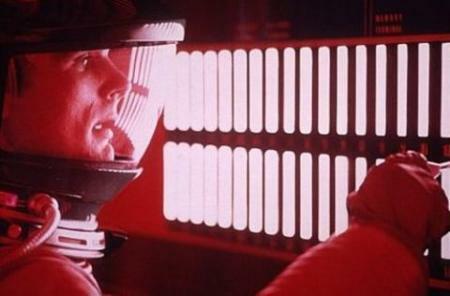 The scene where Dave Bowman disconnects HAL's memory modules and makes him sing a song as a means of a factory default is nothing short of brilliant.! 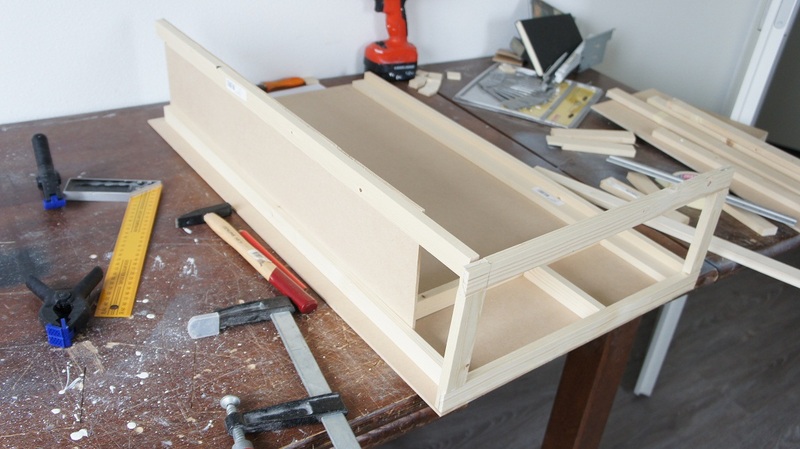 The frame will be made of Pine and MDF. 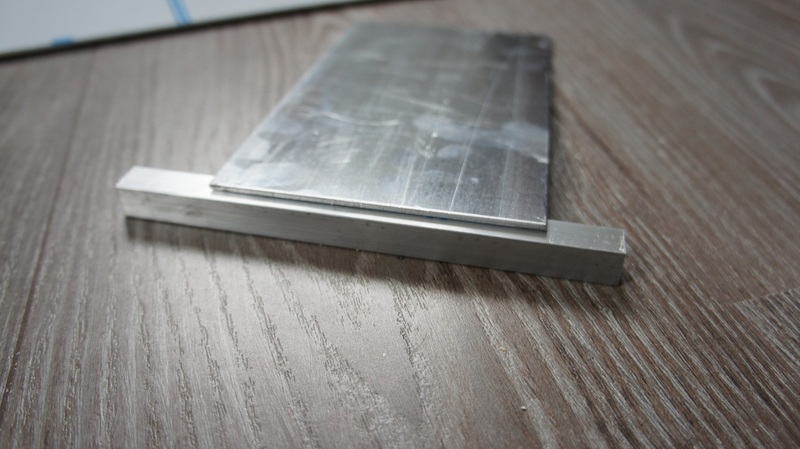 We would have liked to use ALU but we dont have any means of working the metal. 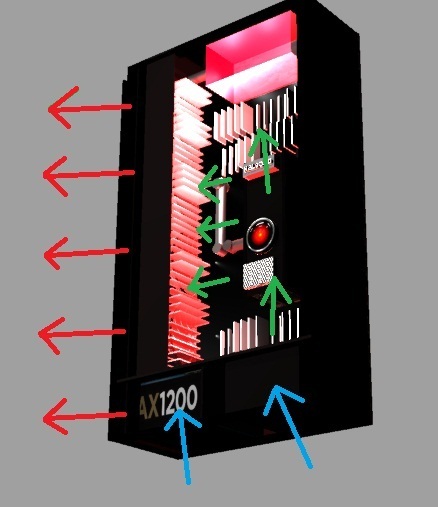 The visible inside of the case will be designed around a full cover plexiglass sheet covering most of the hardware (creating a closed well ventilated room) with numerous frosted red/white illuminated plexi memory modules and black/red shades to finish it off. 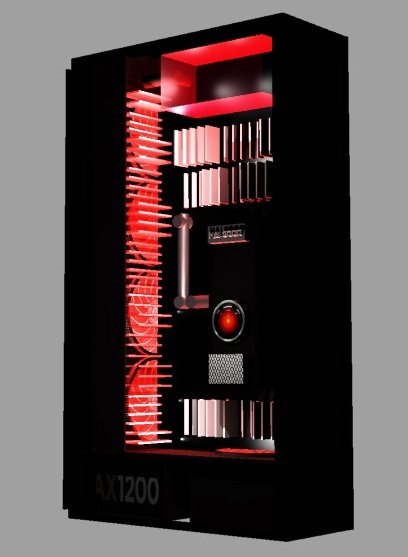 The 580GTX 's will be covered by a plexi encasing resembling the HAL9000 interface. The outside is where Nixjuh will show his considerable talent! Special engravings of 10 of the most impressive scenes from the movie will cover the clean and featureless black metal hood that will be placed over the internal frame. We have something special in mind for the on/off and reset buttons and side window but we cant tell too much about that yet. 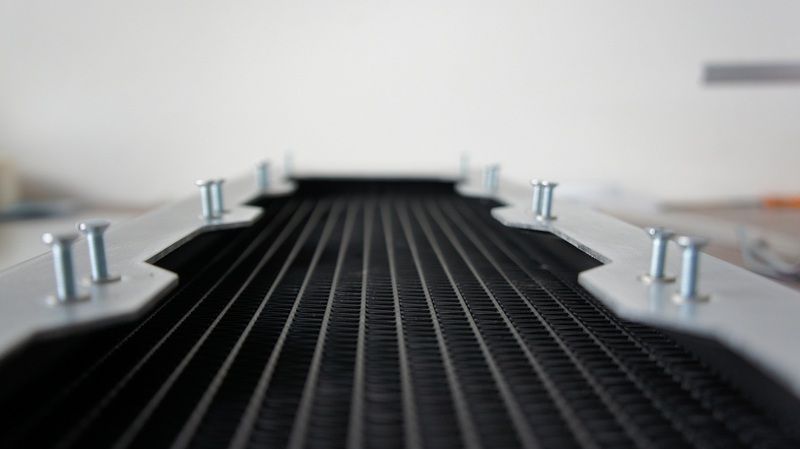 We can tell you that the casing will be put onto a rocky platform with several USB ports integrated into it and that &#34;the dawn of man&#34; is its main design criteria. We cant tell you how much fun we already have had designing and preparing for the build and hope that you'll be as eager as we are to find out how the concept will evolve and grow. Here's an update on the work done so far ! Ok so here goes ! 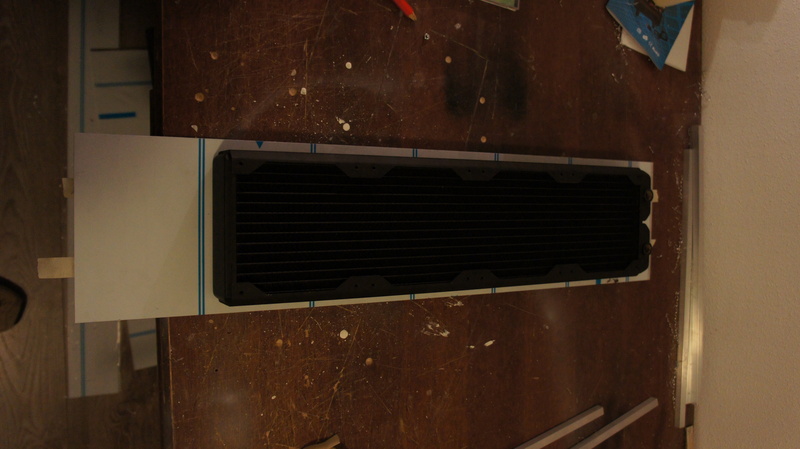 The 3D design did come in handy now, easily got all the measurments from the design and was sent to the ALU vendor. So what have we got? 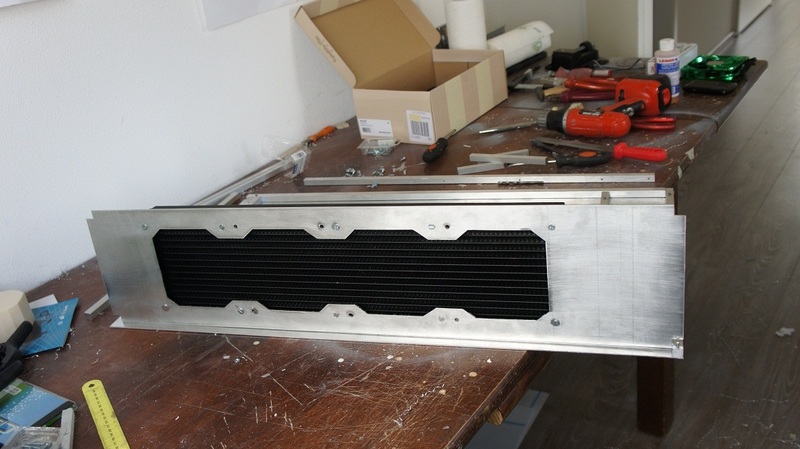 12x12 mm square rod ..
And 2mm ALU panel ..
First sized up one of the major defining elements, the massive BlackIce GT 560 Extreme ! It should fit with a couple of mm left after the rods have been placed, we will see ! I already have most of the hardware so a quick test fitting to see how she goes ..
Only had green and 120mm enermax fans , they will be exchanged for 140mm red's ! 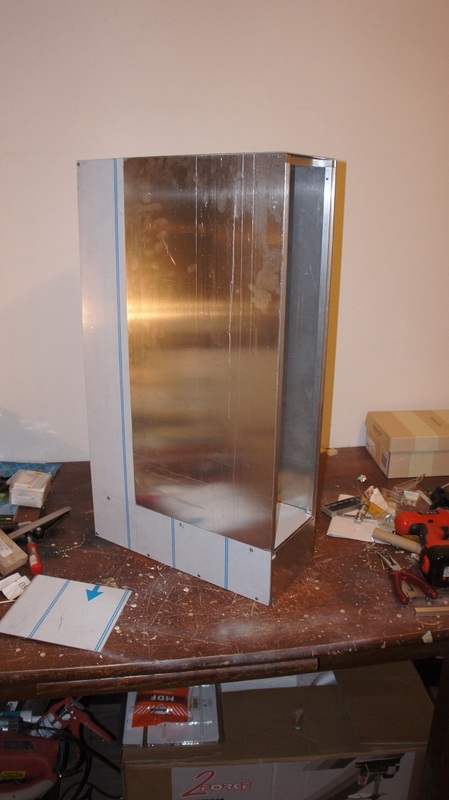 One of the toughest things (IMO) to do if finding the right locations for the fan holes and screws .. Couple of hours later, man that aluminium works great ! And the final state for tonight, got a good day tomorrow also ! 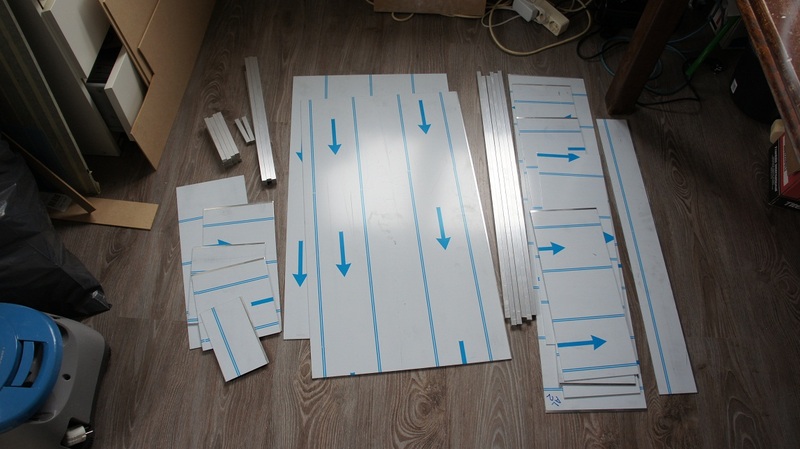 Will be traveling to Nixjuh (30KM) and work on the frame from there. He has got something very (VERY) cool to show ! 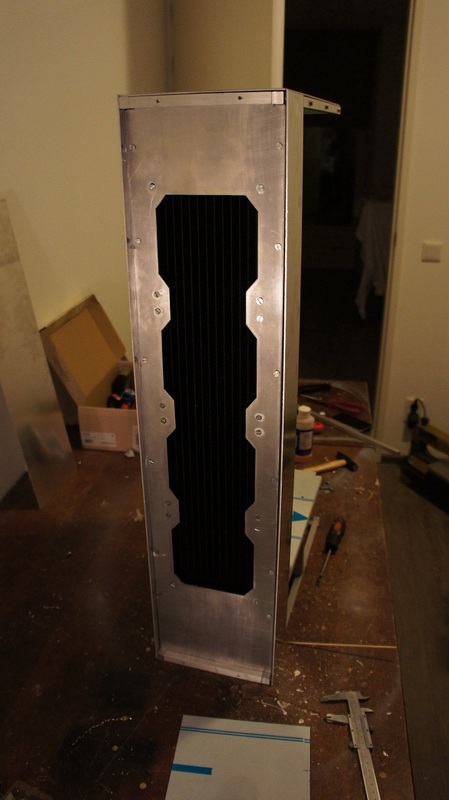 And the monolith is born, Imagine all black alu and red enermax behind the rad ... Could look cool I think ! At the moderation team, I am building this baby with another user, can he also be added as one of the topic starters? This is a spectacular idea. One of the greatest movies of all time, as well. It looks like you are doing a fitting tribute to it. Thanks man ! Coming from you is a real compliment! I love your aztek build, its off the charts ! First of all I will introduce myself a little and tell you my place in this build. I ran into Asphiax when I came looking for the EURISKO. 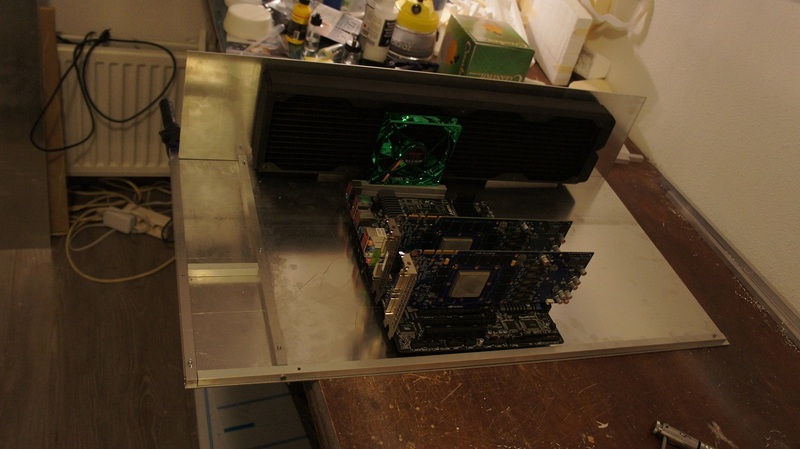 Then we started talking about our passion for SCI-FI and came up with the idea for this build. The first weeks we only did a lot of brainstorming to come up with a good and unique concept. 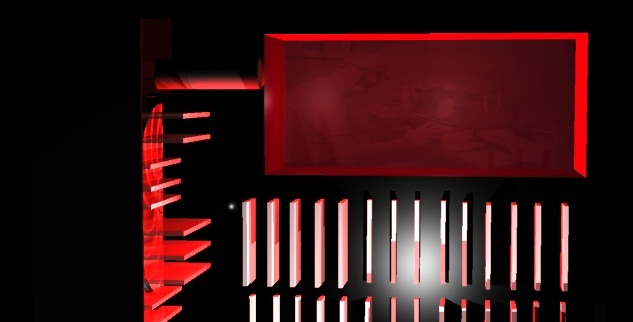 As you saw in the start post above, Asphiax made some awesome 3D renders and started building the case. Yesterday I saw it for the first time and it really shows some craftsmanship and quality! This case will be about the fun of building and learning new skills. 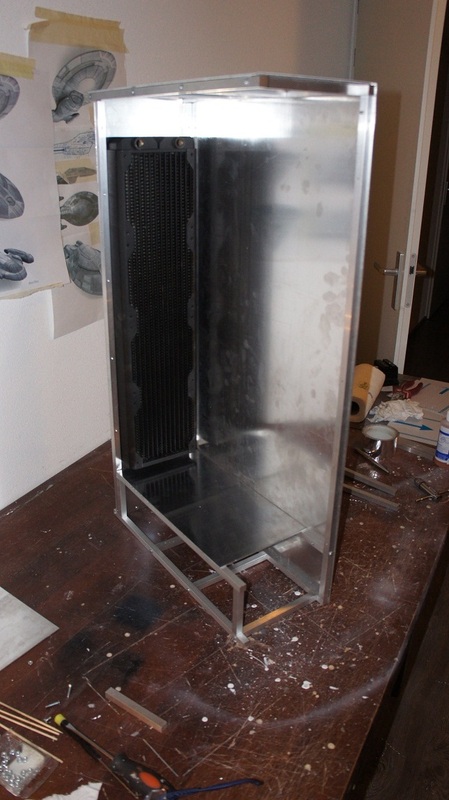 And this is where I come in, I will be doing most of the artwork on the outside of the case. There will be 10 engravings on the outside of the case, which will all resemble a scene from the movie. Also there will be some real 3D features on the outside, but thatÃ¢â‚¬â„¢s something for later (hence the censored on the photo) But remember, this is just a mock-up for the placing and the content of the engravings, the final engravings will not feature shadow or colors or anything ofcourse. 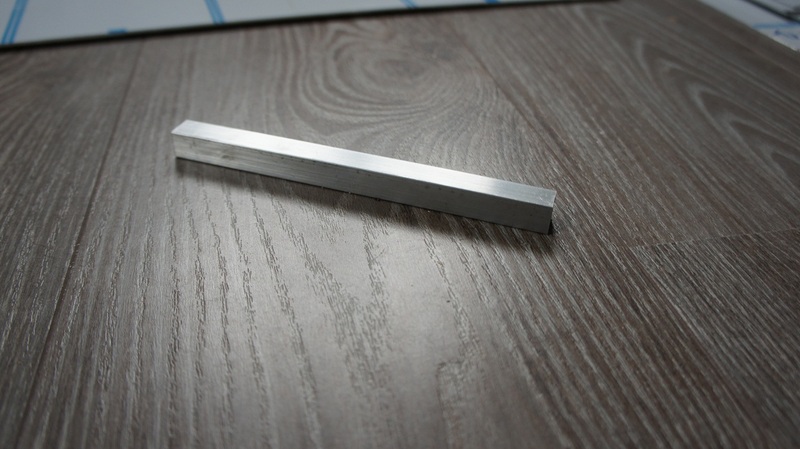 Today we will show you our plans for the engravings so here we go! 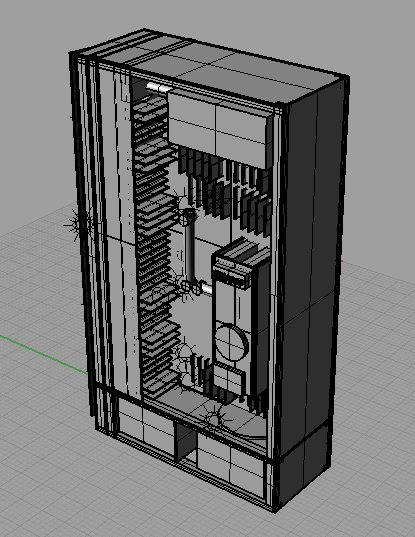 This is a 3D render of the case including the outside casing. 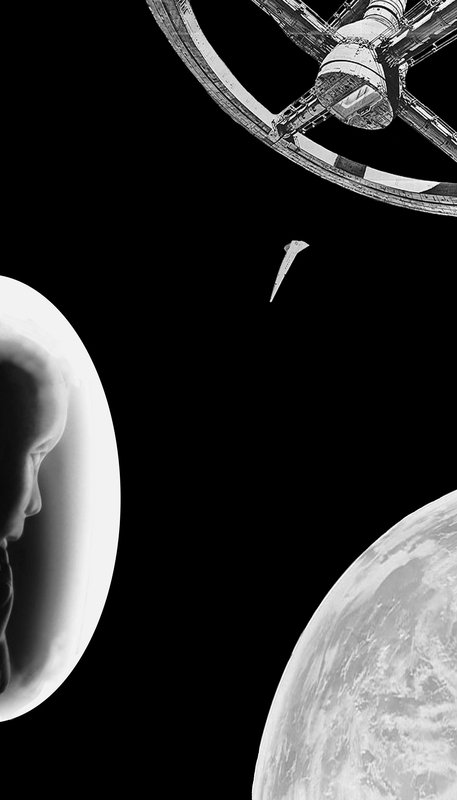 The front will show a picture of the apes touching the monolith, and the astronaut inside a tunnel. 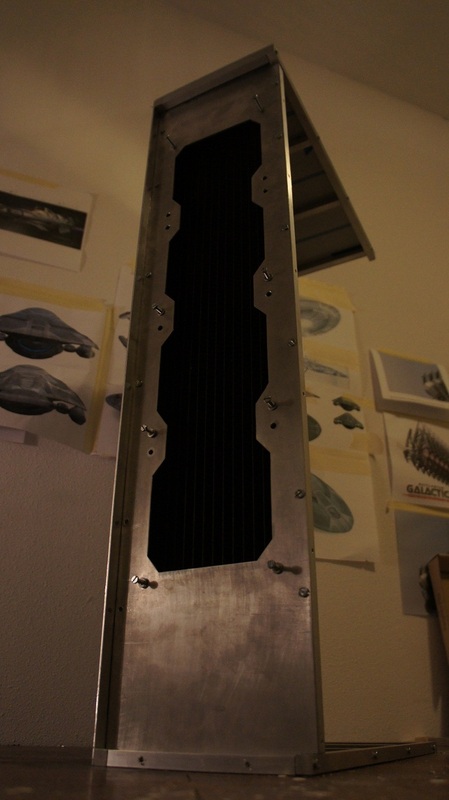 On the top we will have an engraving of the Discovery 1. And in the back it will feature the rising moon and the astronaut inside the centrifuge in Discovery 1. Now for the two largest panels. 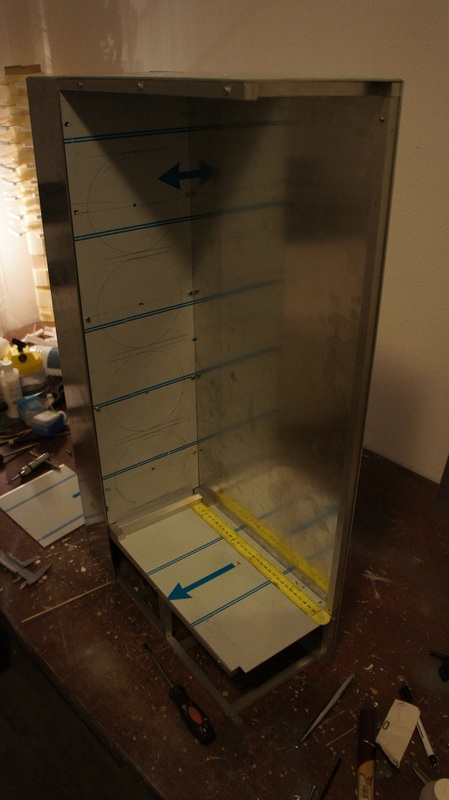 And the last but most certainly not least side will have a plexiglass window in the shapes of some tears in the metal. This has to do with our own chimera, in which the ape finally manages to damage the monolith. Hence the theme Ã¢â‚¬Å“The rise and fall of menÃ¢â‚¬Â�. It will also feature an engraving of the EVA . And an overall layout of all the engravings to give you a better understanding. And the final feature will stay a mystery for now, but we will keep you posted! So here we are with another update! We wanted to keep a little surprise, instead of give all away in the first post. The monolith will be standing on a baseplate. On that plate, in the place where we put the Ã¢â‚¬Å“censoredÃ¢â‚¬Â� in the picture we will put an ape. First of all, I see you thinkÃ¢â‚¬Â¦.. an ape?!? Remember the sequence in which the ape gets evolved by touching the monolith? The idea behind the monkey and the tear in the monolith comes from the human nature to break the things we donÃ¢â‚¬â„¢t understand. Kubrick and Clark pictured Dave Bowman as our ambassador in the alien world, but what if we actually managed to break the thingÃ¢â‚¬Â¦..?? Asphiax found this awesome picture online, and we just had to use it in some way. In one hand he will be holding a stone tool (which will function as the power button of the pc) and in the other he holds a broken bone. 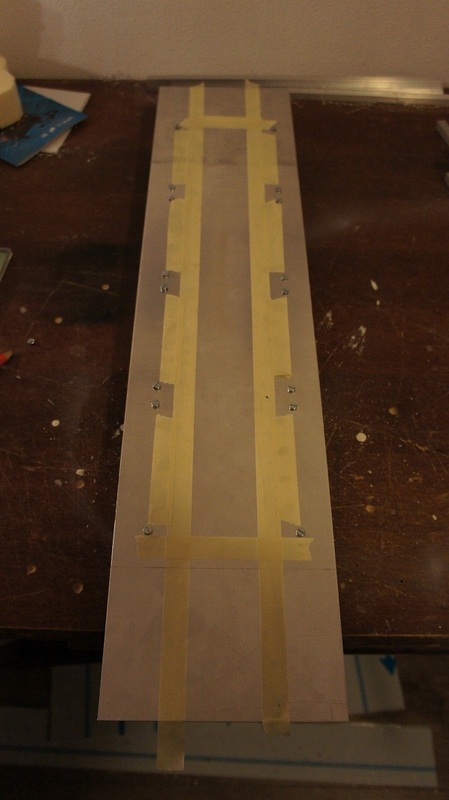 To start building the model, which I made in clay. We bought a wireframe and shaped it. But after a few hours of work it started to take shape like I wanted. Then I made the hands and the upper body. And put on the head. This is where the wire to the mainbord goes. So here is the final model, it only needs painting to be done, before we can place it on the baseplate. And today I went to the store to buy some tools to get started on the engravings! DonÃ¢â‚¬â„¢t really know what to use yet, so I bought some engraving tools for the Dremel multitool, but I also bought a special engravings machine. 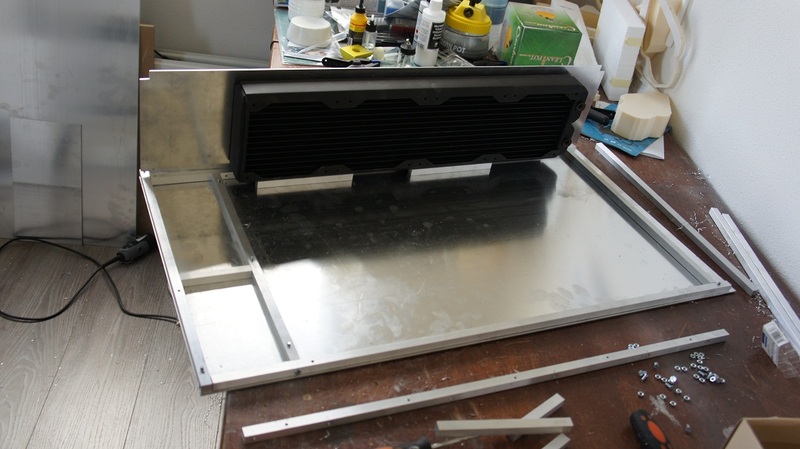 So this weekend we will start working on that! But First I can announce a couple of sponsors ! 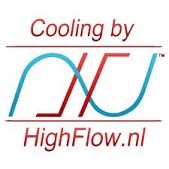 My favorite webshop for watercooling supplies Highflow is gonnan pitch in also ! Thanks Freddy ! 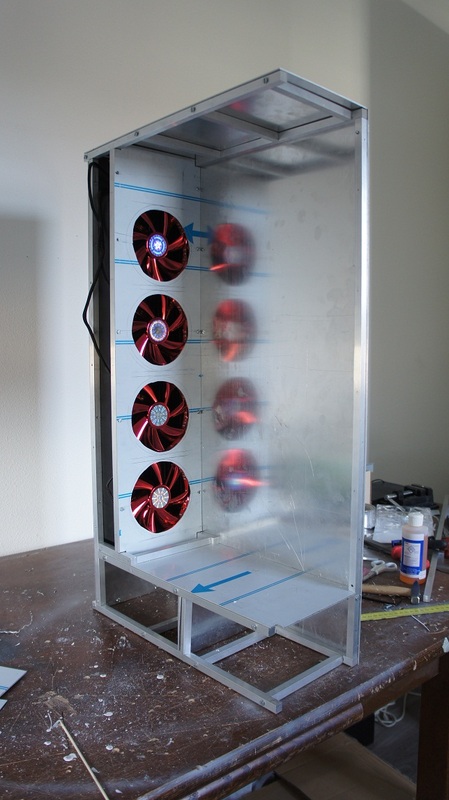 Lamptron is going to help us by supplying the powerfull touch fan controller needed to control the fans! The best group on facebook for your SCIFI Obsessive Creation Disorder. 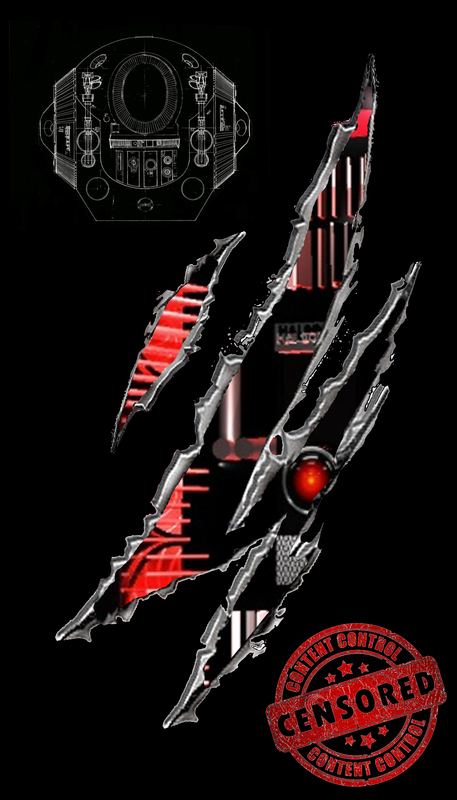 We have over 50 Star Wars, Star Trek, BSG, Alien and other SCIFI Mods. 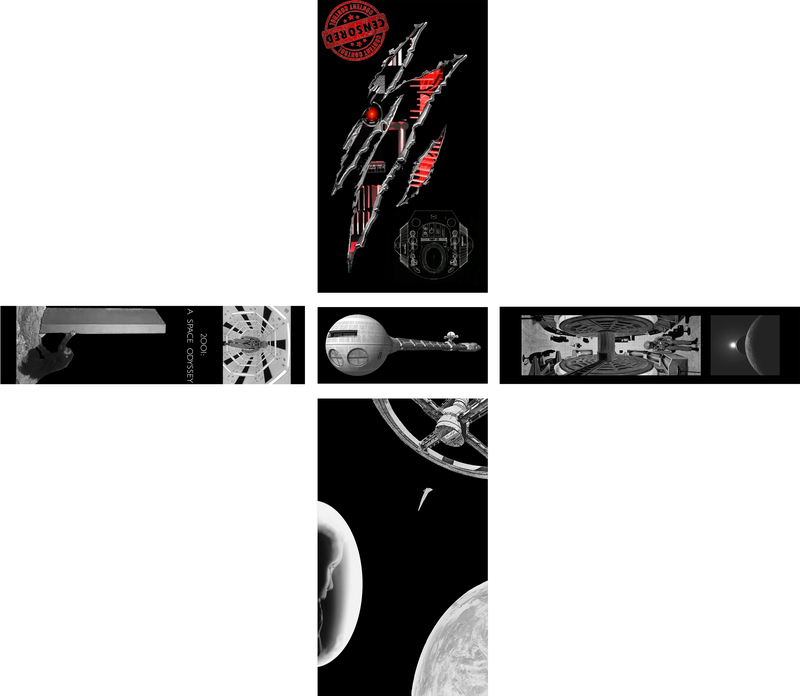 Join us and share your SCIFI creations !!! Ok Now to the build !!! 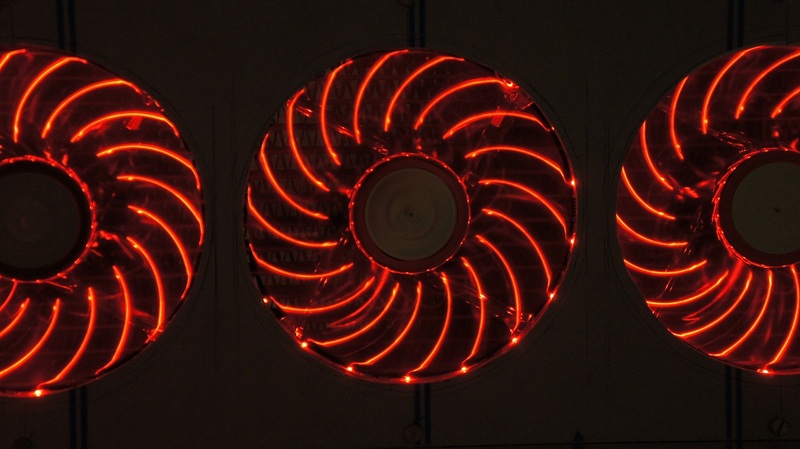 The Enermax fans have arrived ! 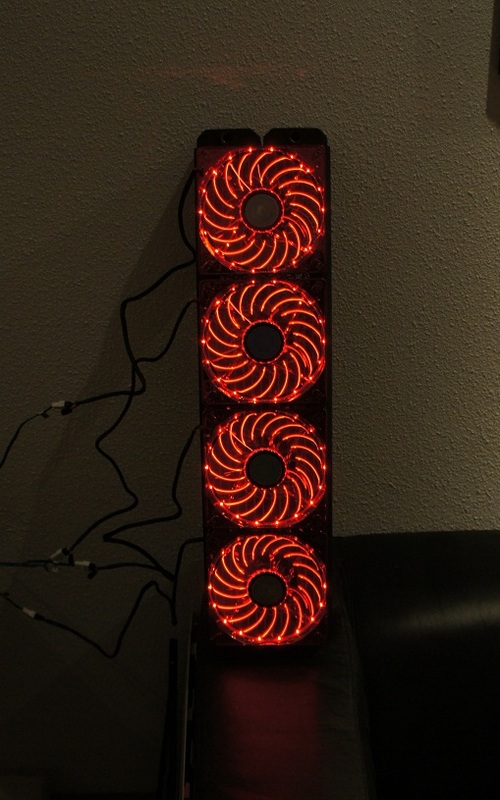 140mm of Red eyecandy ! 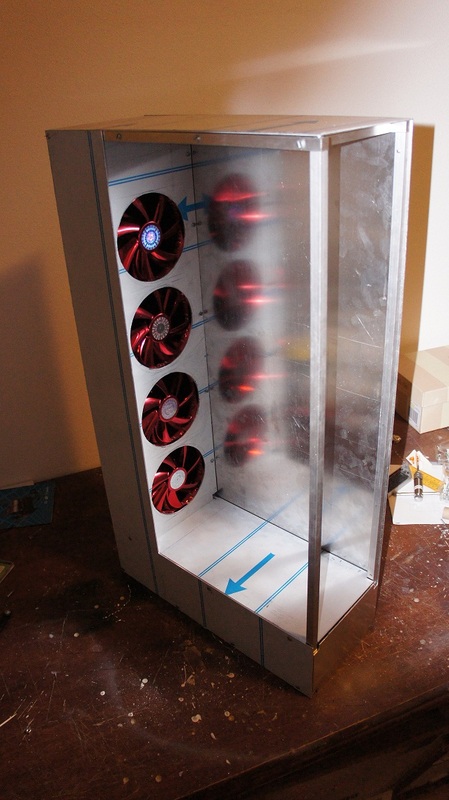 Fitted the whole rad and fans in the tight space designed for it. It fits upto the mm! 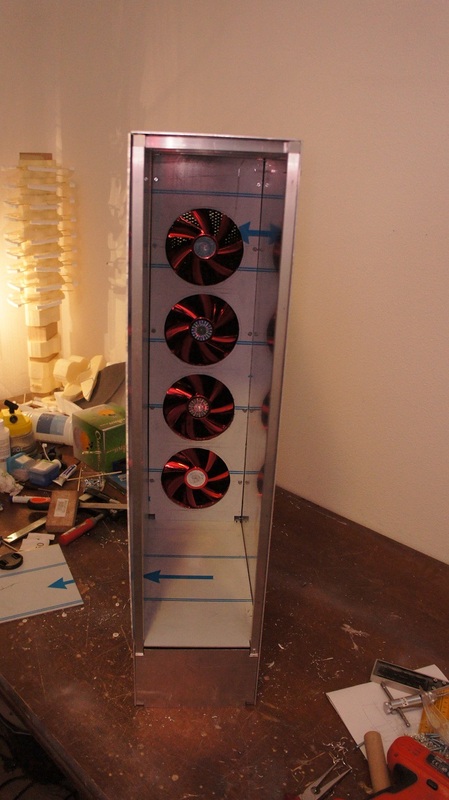 I need to extend the Fan cables to the fan controller, but I was expecting that ! 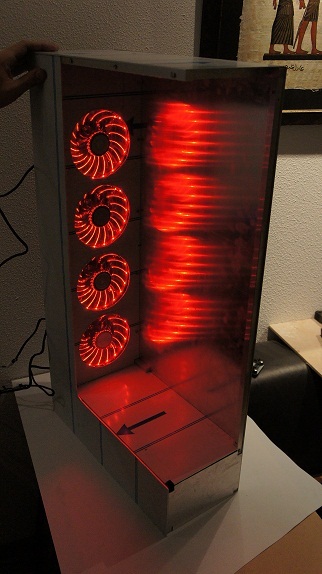 I am looking for a company that can laser me a sweet red plexi 560 fangrill with a design I made. Another major obstacle, I need to get the exact position of the fans drawn out correctly. This proved to be a time consuming exersize. 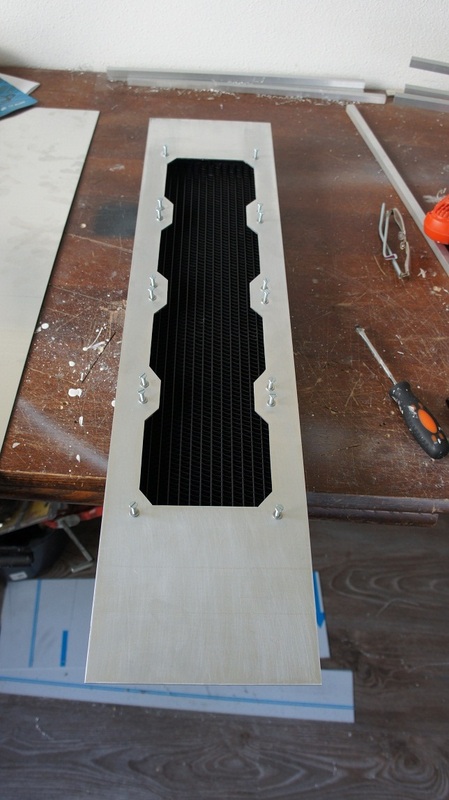 With the fan holes very roughly cut out, I decided to do a quick testfitting to see how they would look within the whole design. 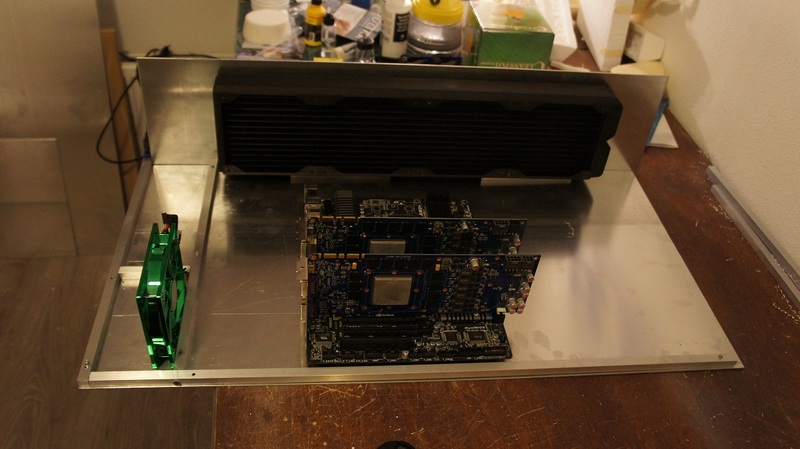 The 2 x GTX 580's have not been fitted with the EKWB blocks , hoping they will arrive soon !!! 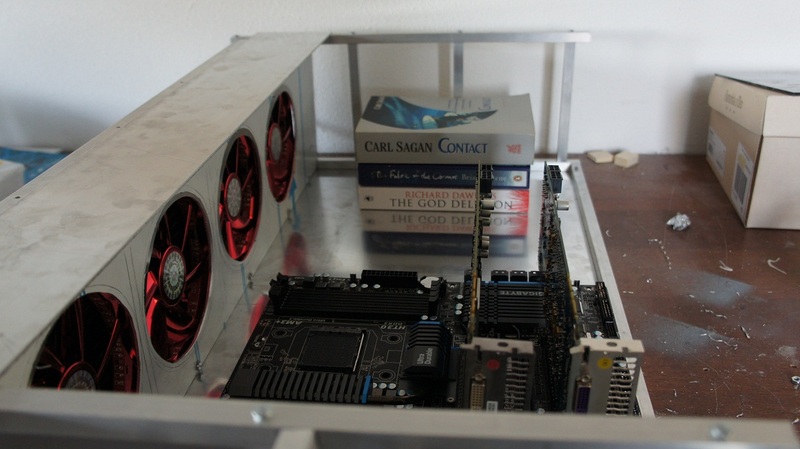 I used a temp motherboard for the fitting and a stack of books to resemble the reservoir ! Get set, ready .... GO !!! Here's to a couple of hours filing ! Nom, Nom .... Enermax !!! 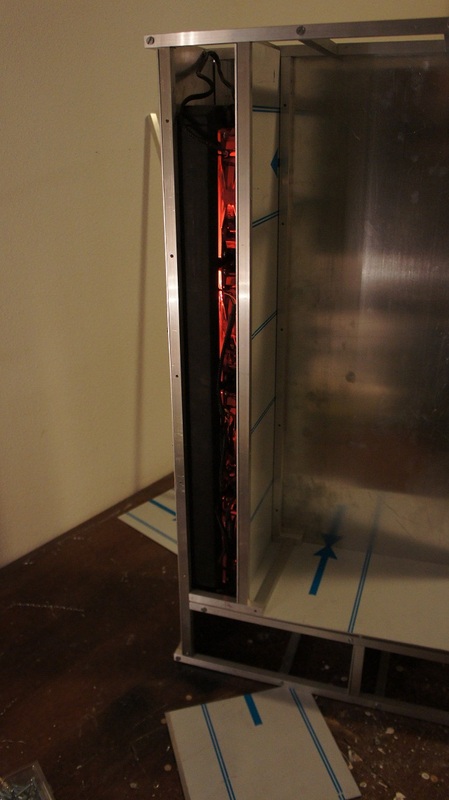 A quick test if they all worked before I close up the Rad compartment ! And here is the final status of today ! 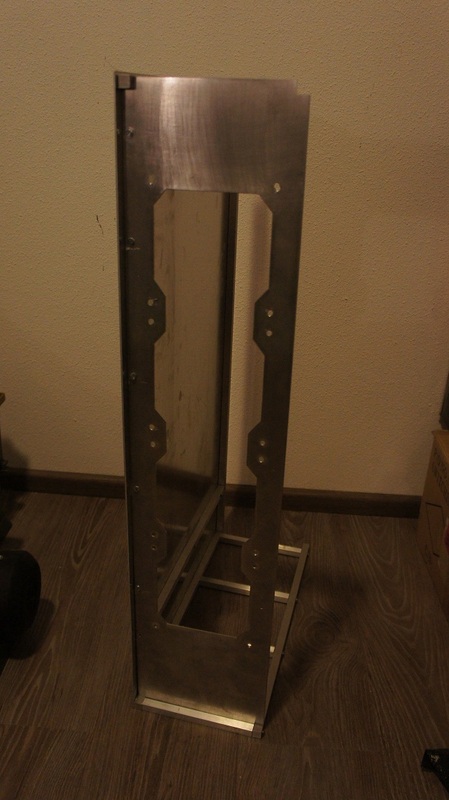 I need to put in more M4 screws to tighten it up but that's for next time, now to grab a couple of beers ! 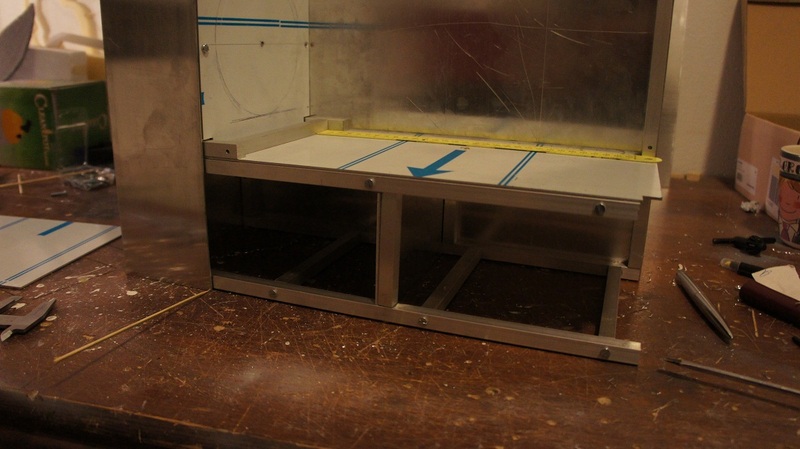 Oh yeah, I made this picture to show you how the plexiglas window will be placed. 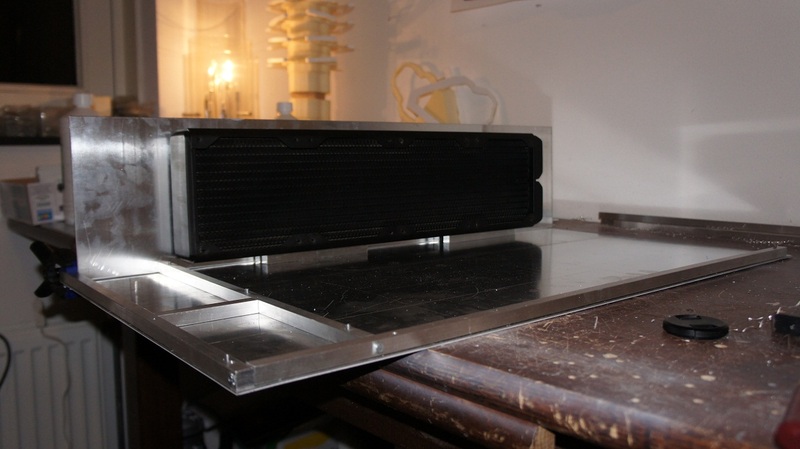 With the hood off, it will deliver a perfect look into the case ! but what if we actually managed to break the thingÃ¢â‚¬Â¦..?? That's perfect! Because, of course, we would break it. And that is fitting to attribute that to Kubrick's vision. It's a good thing it's tougher than that. (We did break HAL though, so it all makes sense). Great stuff and welcome to the forums as well. 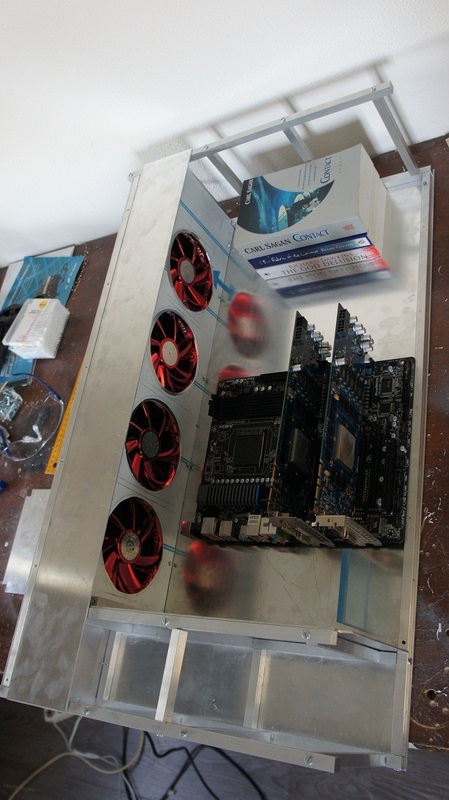 Collaborative case modding, this is epic work you two.